The Daily Rant: Dream. Plan. Ride. I think a more appropriate name would be the "End of the Relationship." Ed has been riding around our area here in Southern Arizona, and he went on a day trip with our friend MacG, and also participated in a two-day event in Flagstaff hosted by the Coconino Trail Riders. He's trying to get in as much riding time as he can. We were planning on going to this event next week but it looks like we may have to work. I have my motorcycle license, but I definitely won't be riding. It's more of an Ed thing. I'd just be there for the food and blog post pictures. I watched the video on this website by the guy who owns the company and it seems like a great way to ride some terrain with experienced riders giving tips along the way. Of course, Ed (and most men) don't think they need any instruction, but I feel better knowing he's reinforcing what he already knows. Especially if he plans on one day going to South America. In the meantime, he plans on riding the Arizona Backcountry Discovery Route (AZBDR) which runs from the Mexico/Arizona border to the Arizona/Utah border, in the very near future. It's a 4-6 day trip depending on how much ground the rider covers in each section. 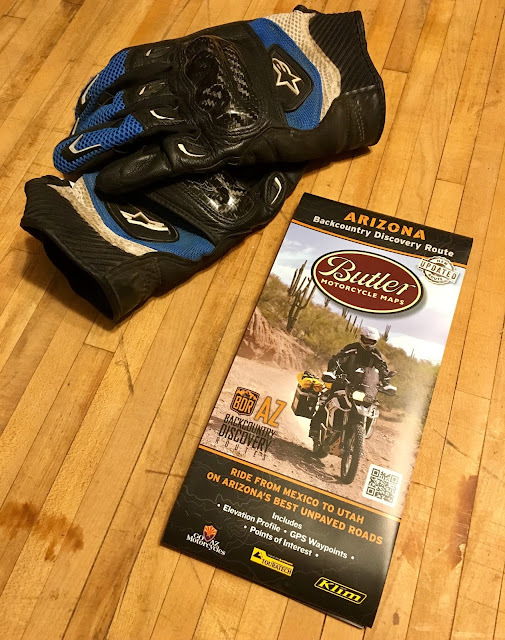 And because I'm trying to be a supportive wife, I bought him a Butler Motorcycle Map, which are supposedly some of the best of their kind, that covers the route he's planning on riding. The map, in addition to his Garmin inReach Satellite Communicator, should suffice for his navigation. And I will be able to breathe a teensy bit easier.